I am continuing work on a series of probate/estate cases from three members of the Behrens-Sartorius family in Adams County, Illinois, for upcoming Casefile Clues articles. We are going to be spreading some of them out so that readers don’t get burnt out on the family or the time period. There were actually seven different files for a total of three estates that were settled. A little organization will be helpful. I created a folder for each of the estate files and downloaded the probate records from Ancestry.com, reminding myself that there may be ledgers and journals the courthouse does not have. volke-sartorius-guardian–the case file wherein Volke Sartorius is appointed guardian for her minor children, done after Ulfert Behrens died. My organization does not end there. These estates were being settled in the 1880s and all involve Volke Sartorius in one way or another. Her father was appointed administrator of her husband’s estate and he had to petition the court to sell the real estate. Volke bought back her home, but was left with little money. After her father died, she was appointed guardian of her husband’s minor heirs, largely so she could sue her father’s estate for their back wages when they lived with him. My next step is to make a chart listing all the documents in these files so that I can put them in chronological order. That may help me to notice things I’ve not previously noticed as these case are intertwined. This entry was posted in Uncategorized and tagged herman sartorius, ulfert behrens, volke satorius on February 1, 2016 by mjnrootdig. I’ve published a complete back issue list on our new blog site. If you are missing issues, email me at michael@genealogytipoftheday.com and I’ll look into it. If you’d like to see what we’ve already written on, check out the list. This entry was posted in Uncategorized on February 1, 2016 by mjnrootdig. We are still in gear up mode here at Casefile Clues, but it is good to be back. Writing the newsletter regularly again has reminded me of the importance of writing as a part of the research process, even if the research is not completely done. Even when we think it is done, writing things up often makes it clear that our work really is not done. We’ve got some new and interesting topics coming up, stay tuned! And thanks for your support of Casefile Clues. It is appreciated. This entry was posted in Uncategorized on January 31, 2016 by mjnrootdig. If you are a subscriber to the PDF version of Casefile Clues and you are missing issues, email me at michael@genealogytipoftheday.com. Responding to earlier newsletter mailings sometimes causes the messages to get lost or misdirected. Thanks! We are offering sessions of our popular US land and probate classes this February. Additional details are on our announcement page. It looks at an 1889 will for a German immigrant to Illinois. Other than the names, the will has nothing to do with the testator being German. The issues and analysis are really independent of the state in which the will is located as well. There’s several issues in it that are worth thinking about. This entry was posted in Uncategorized on January 29, 2016 by mjnrootdig. 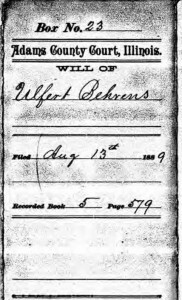 There are two separate filmings of the will of Ulfert Behrens in Adams County, Illinois. It appears that there are several wills in the late 19th century for Adams County, Illinois, that were microfilmed twice. We’re using that will for the next issue of Casefile Clues. I need to make certain that I am precise in my citation so that I cite the correct filming of these records as both filmings have been digitized by Ancestry.com. This entry was posted in Uncategorized on January 27, 2016 by mjnrootdig. The next issue of Casefile Clues should go out 28 January. It looks at an 1889 will from Adams County, Illinois. It’s part of an ongoing study of a German immigrant family whose estate settlements are somewhat atypical. While not discussed in this issue, the testator of this will, Ulfert Behrens, died twenty-one hours before his wife. He apparently thought she was going to die before him as she is not mentioned and her clothing is given away in his will. Note: This was recently posted to my Rootdig.com blog, but am reposting it here as it relates to our latest issue. Because Ancestry.com has so much material and so many databases, I used the title of the database from which the probate imges were pulled. I don’t do this for the US federal census because I’ve never done it and locating the census images is relatively easy on Ancestry.com. There are some states for which Ancestry.com has several probate databases and the title makes the Ancestry.com location of the material easier. I ended up with the item shown below–hopefully in the spirit of Evidence Explained . I spent far too much time concerning myself with where to place the title of the database. Hancock County, Illinois, Probate Court Files, Box 113, Estate of Mimken Habben, Petition of Antie Habben to be Appointed Administratrix with the Will Annexed, 26 March 1877; Ancestry.com, “Illinois, Wills and Probate Records, 1772-1999,” (http://www.ancestry.com : accessed 3 January 2016), citing FHL microfilm publication 1547540. I’m open to suggestions. This seemed to fit my purpose for the time being. This item is one that is analyzed in the next issue of Casefile Clues. This entry was posted in Uncategorized on January 18, 2016 by mjnrootdig. Issue 3-48 is out. If you are a Casefile Clues paid subscriber and do not have it, please email me at mjnrootdig@gmail.com.